Discoveries of first-order transitions in amorphous ice and in fluid phosphorus have attracted wide attentions because they have overturned conventional wisdom that structural changes in liquids and amorphous solids are gradual and monotonous, and a new trend is emerging in the research on disordered materials. To study structure of disordered materials, the neutron scattering method has advantages, such as high sensitivity to light elements and high real-space resolution, over the x-ray scattering method. 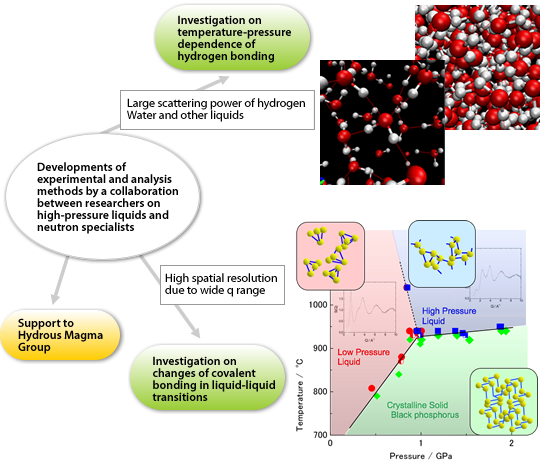 The Liquid Group aims to realize in-situ high-pressure high-temperature neutron scattering experiments on liquids and amorphous solids at J-PARC by developing experimental and analysis methods. Utilizing this unique experimental capability, the group plans to study water and other simple systems for which neutrons are a powerful probe. Besides pursuing advanced research on disordered materials, the group also provides technical supports to the Hydrous Magma Group in this project. The initial aim of the Liquid Group is to realize in-situ high-pressure high-temperature neutron scattering experiments on liquids and amorphous solids, which have not been performed in Japan before. The future research topics include pressure and temperature dependence of hydrogen bonding in liquid water, changes in chemical bonding upon transitions in liquids and so on. Core members have experience in liquid studies using synchrotron radiation x-ray and high-pressure high-temperature generation techniques. They develop experimental and analysis methods for high-pressure neutron scattering in cooperation with other members, specialists in neutron scattering studies on disordered materials. Liquid water shows many unique properties that are not observed in usual molecular liquids. These anomalous properties are attributed to four-fold coordinated network structures due to hydrogen bonding, which is well preserved in the liquid state. Our in-situ x-ray diffraction experiments on liquid water have revealed that the local arrangements of oxygen atoms, (i.e. water molecules) changes towards a simple-liquid-like structure upon compression. Neutron scattering experiments on liquid water, on the other hand, gives information about positions of hydrogen atoms. By combining x-ray and neutron data, pressure and temperature dependence of hydrogen bonding will be discussed. Knowledge about water structure and hydrogen bonding is one of keys to understand the role of water in deep earth. A significant change in covalent bonding is expected to occur upon a first-order transition between a molecular liquid to a network liquid in phosphorus and upon a semiconductor-to-metal transition in liquid selenium. From high real-space resolution neutron pair correlation functions, changes in chemical bonding will be discussed in detail. The experiments and analysis methods developed by our group will be used in studies conducted by the Hydrous Magma Group.